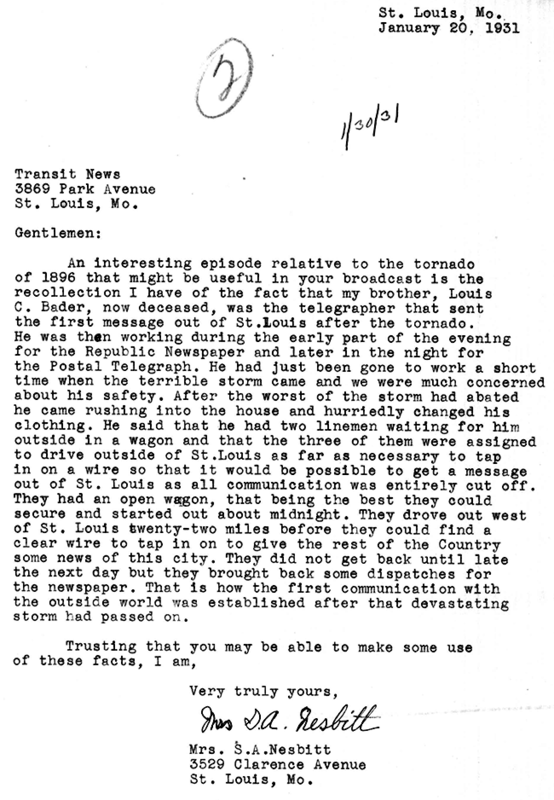 In the January 6, 1931 issue of the St. Louis Public Service Company newsletter, Transit News, a notice appeared asking people for their recollections of the 1896 tornado. This notice resulted in a large number of submissions. 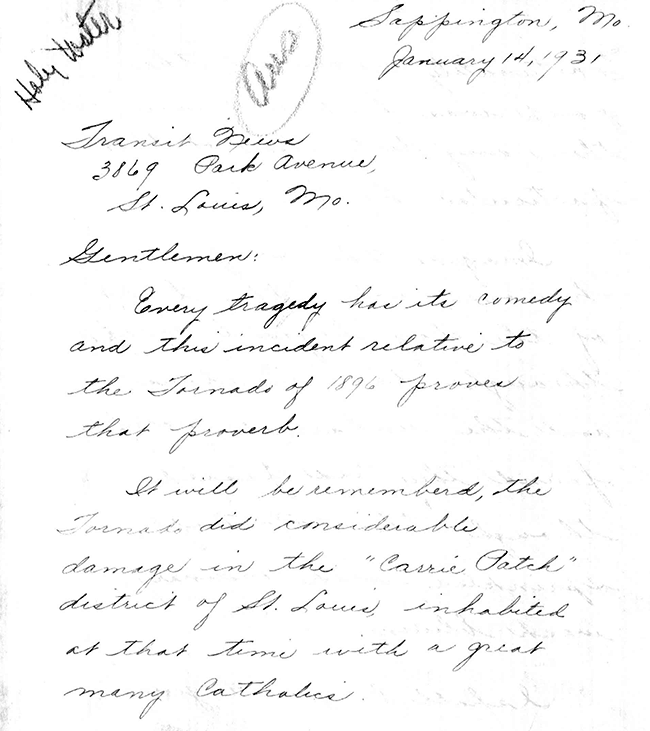 Over fifty of these letters were donated to the St. Louis Public Library in 1961 and are housed in the Rare Books and Special Collections Department. 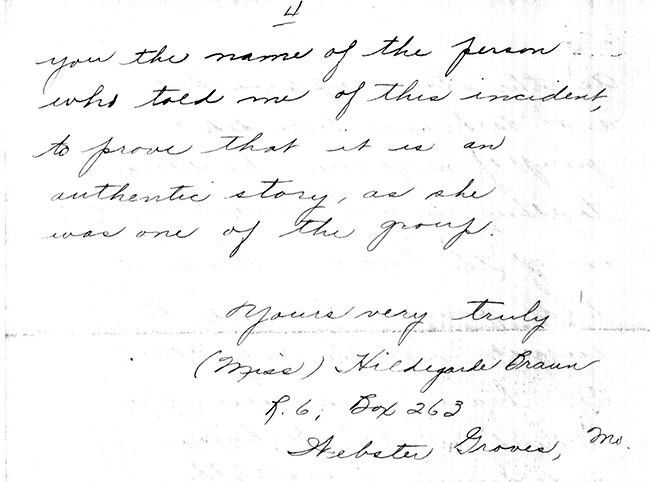 Every tragedy has its comedy and this incident relative to the Tornado of 1896 proves that proverb. 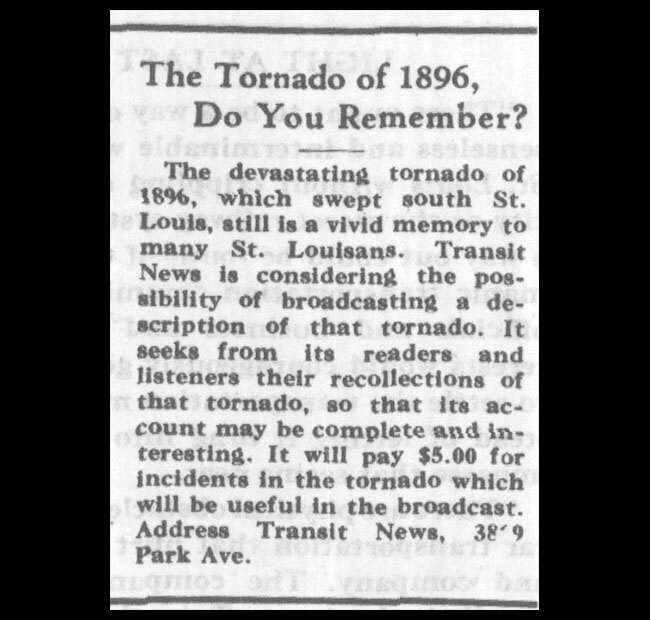 It will be remembered, the Tornado did considerable damage in the “Carrie patch” district of St. Louis, inhabited at that time with a great many Catholics. As the storm approached and darkness descended a group of neighbors huddled together in a basement of one of the homes. 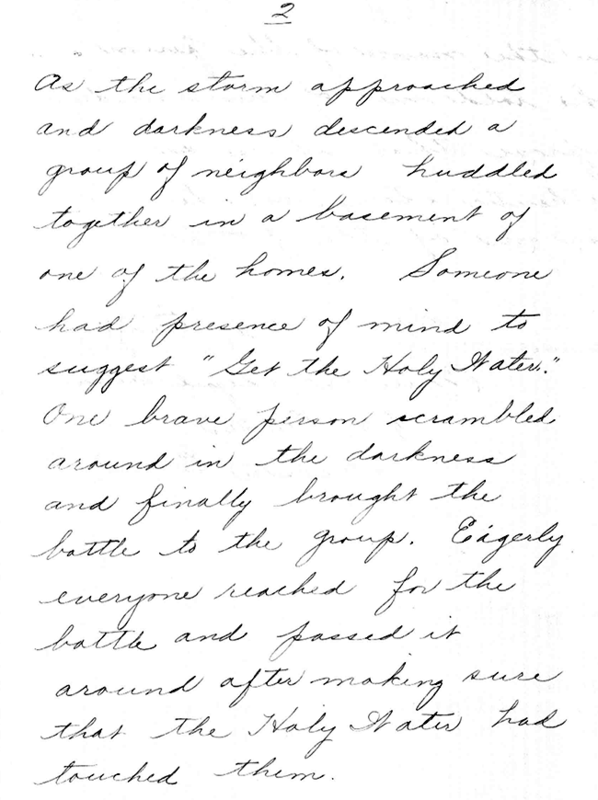 Someone had presence of mind to suggest “Get the Holy Water.” One brave person scrambled around in the darkness and finally brought the bottle to the group. Eagerly everyone reached for the bottle and passed it around after making sure that the Holy Water had touched them. Fortunately no one in the group was hurt nor was there any destruction of that particular house. 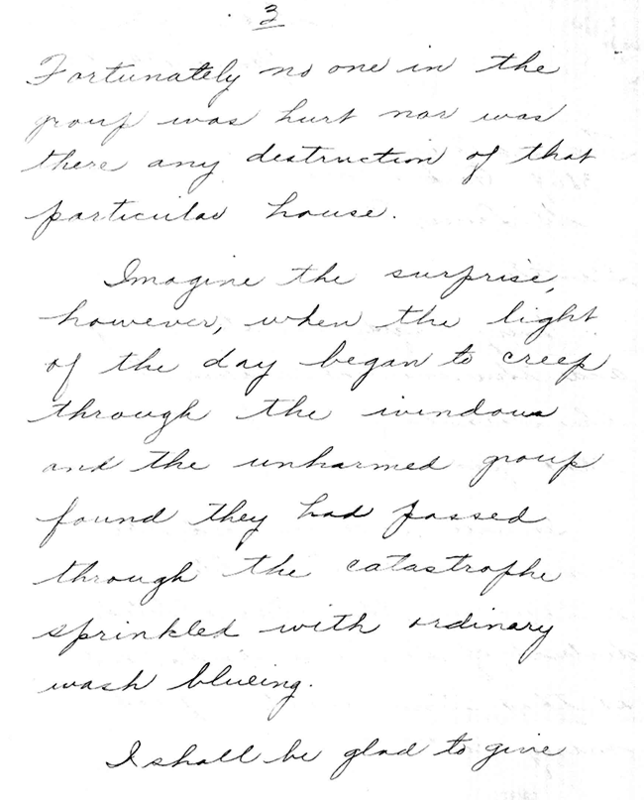 Imagine the surprise, however, when the light of the day began to creep through the windows and the unharmed group found they had passed through the catastrophe sprinkled with ordinary wash blueing. you the name of the person who told me of this incident, to prove that is an authentic story, as she was one of the group. 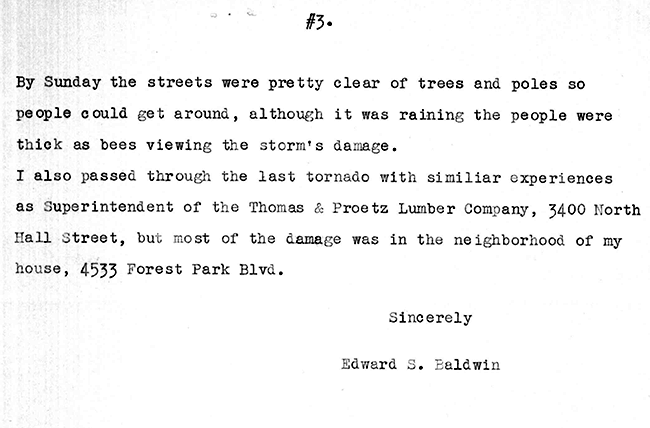 The tornado of 1896 was of a very different nature than the one of 1929. The latter being more of a wind storm blowing roofs from houses and demolishing weakly constructed buildings, while the tornado of 1896 seemed to be heavily charged with electricity and destroyed many solid structures, leaving weak houses and shacks intact. 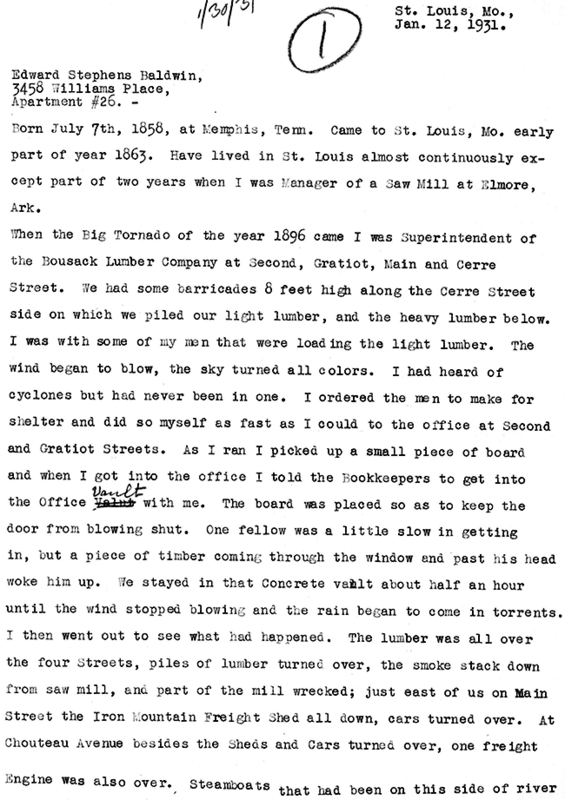 The reason I am convinced that the tornado was electrical is on account of the many freak stunts that happened, and when told to persons who were not there they call them fairy tales, or use stronger terms according to their nature. One of the peculiar things which seemed to be an electrical stunt was at Koerners Garden on South Eighteenth Street. This place was a large saloon about 75ftx40ft, built on elevated ground with a beer garden in the rear, and as it was summer time the windows were all open. This place was right in the path of the tornado. On the wall was a large wooden clock with metal works. After the storm the building was not damaged and the wooden clock was still on the wall; but the metal works were gone. Another thing I saw was a grand piano, (and they were large in those days) in a small lake in Lafayette Park. This lake is in the middle of the park, a good block away from any houses. Plenty of metal and weight in that piano. Another metal object that was moved was the fire engine at #7 Engine House. It crossed the street and was slammed against a brick house without the aid of horses, they being dead in their stalls. Another stunt that saved the lives of a lot of people happened to a Park Avenue Street Car. At the time the Park Avenue Line going south at Eighteenth Street turned West one-half block on Papin and over a private right of way to Chouteau, running the full length of the Brown Tobacco Factory (now the St. Louis Coffin Co.) A car loaded with homeward bound passengers going South had turned into this alley-way, and had gone about one-half the block when the storm struck. The car was pushed back and around the curve without leaving the track or even breaking a window, so far as I can remember. The car had hardly stopped when the two top floors of this large tobacco factory came down into the alleyway leaving it with debris thirty feet high. 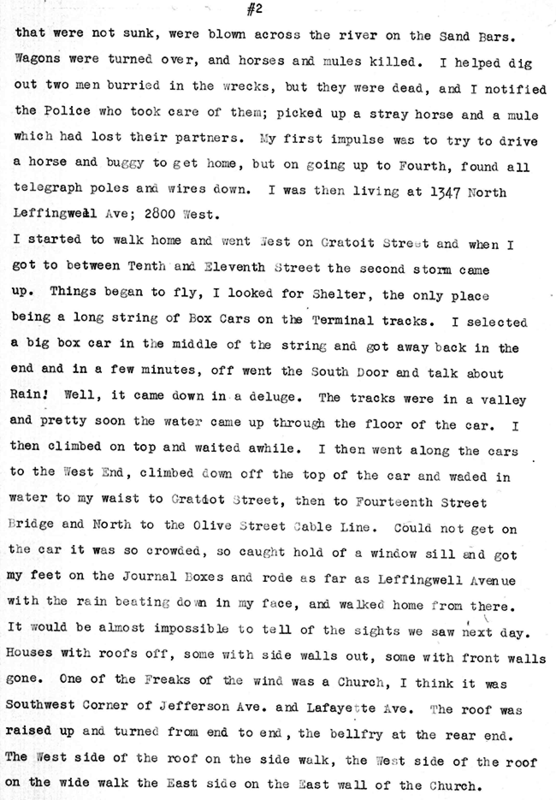 If the car had been equipped with present day air brakes it might have held against the storm and would have been mashed flat. A word of commendation should be given to the Rev. Irl Hicks, the Astronomer and Weather Forcaster. The day of the tornado was a perfect spring day, not a cloud in the sky and no one would have had any idea that a storm condition was approaching. However the Rev Hicks saw his barometer start down about one oclock and notified the Public School Superentendent that a storm was due and advised that the children be sent home. Fortunately the Superentendent was an intelligent man and the warning was headed, the children were sent home. This action saved many lives as several schools were demolished.